Every year I get out the Christmas decorations, I remember so many special moments. Our honeymoon in Cape May 20 years ago. Anticipating our first child. The start of all the wonderful homemade decorations the kids make at school and bring home. Summer trips we’ve taken. Our children’s hobbies and interests. This year, we’re doing a Kid-Crafted Christmas. I’m pulling out all those homemade ornaments that came home from school and CCD and hanging them everywhere. We’re also making new ornaments like the Paper Stars (my favorite!) and the Cinnamon Applesauce Ornaments. On Friday, I’m sharing an easy peasy ornament for toddlers and preschoolers inspired by my trip to Longwood Gardens last Friday. 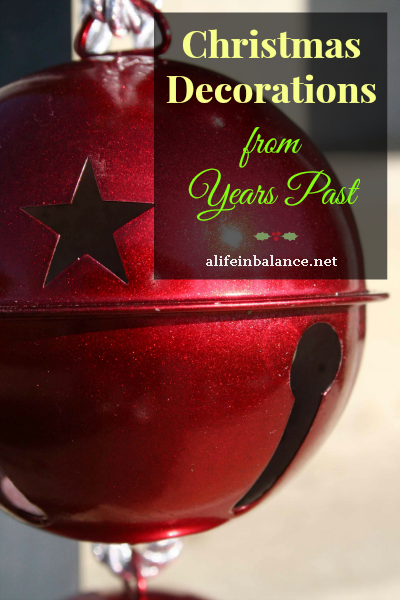 I decided to dig into years past for ornaments we’ll make again, plus 3 easy 5 minute Christmas decorations. I love simple, and these paper trees are definitely simple. Since the kids were really young, I did the drawing and cutting of the trees. 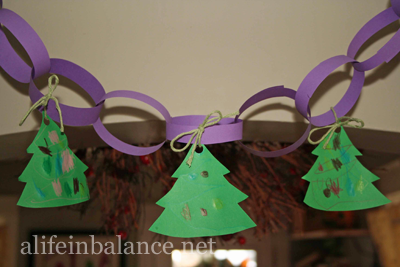 For older kids, make a tree template out of cardstock for them to trace and cut out. We colored our with crayons. Glitter paint , Glitter Glue , Dot Markers , and Washi Tape are all fun easy options for kids. Don’t forget hole punching though it’s a little too easy to get carried away. One year for my daughter’s Nutcracker Birthday Party, my sister found this Gum Drop Tree on the Martha Stewart Living site. 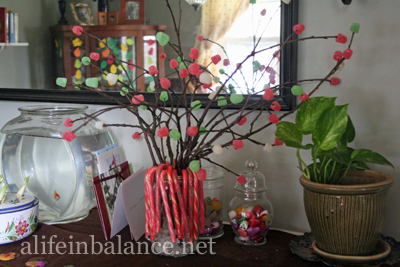 She took a canning jar and filled with it with clear glass rocks from the dollar store, put in some branches from her yard, and added gum drops to the ends of the branches. Hooking candy canes around the edge of the canning jar completed the Gum Drop Tree in under 10 minutes. 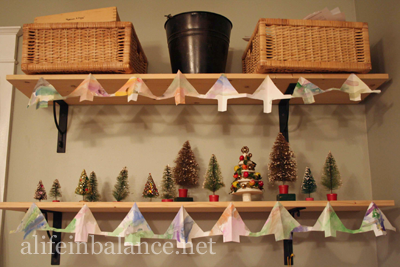 Another simple Christmas paper craft, we made this paper tree garland from watercolor paper the kids had painted. Since each 8 x 10 piece of watercolor paper only yields a few trees, I tape the trees together to form the garland. If you have a roll of brown kraft paper or plain white wrapping paper, have the kids decorate it, and cut one long garland out of the paper. 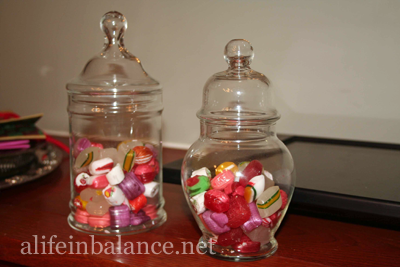 Filling apothecary jars with hard candies is another 5 minute Christmas decoration project. My jars came from local thrift stores. You can also find these jars at Michael’s Craft Store and JoAnn Fabrics; use one of their coupons to save money on the jar. I found the multi-colored hard candy at the dollar store. Peppermints are another long-lasting colorful candy option. Finally, nothing beats filling a thrifted glass vase with small ornaments. You can keep the ornaments the same size, or vary the size. Throw in a battery-operated strand of LED lights for some extra fun. What’s your favorite Christmas ornament made by your kids? Love all these ideas! We need more festivity in this apartment rental! 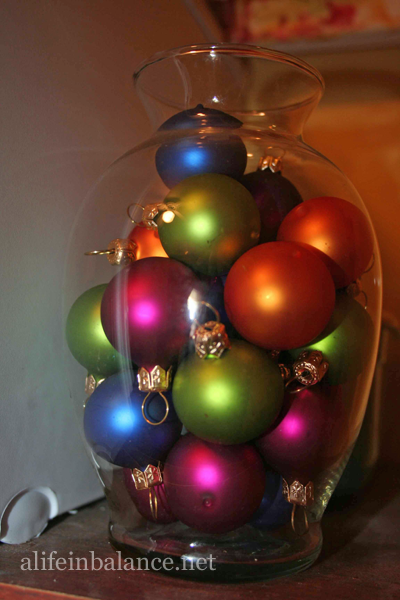 I love the gumdrop tree- and I’m definitely going to try to find something to put ornaments in! Carrie @ Chockababy recently posted..25 Days of Christmas Gift Ideas: 5 Best Baby Books! Simple can be just as effective. I found variagated boxwood swags for $6.98 at Home Depot which add just enough color to my small front porch. All I need is a ribbon to complete the look.